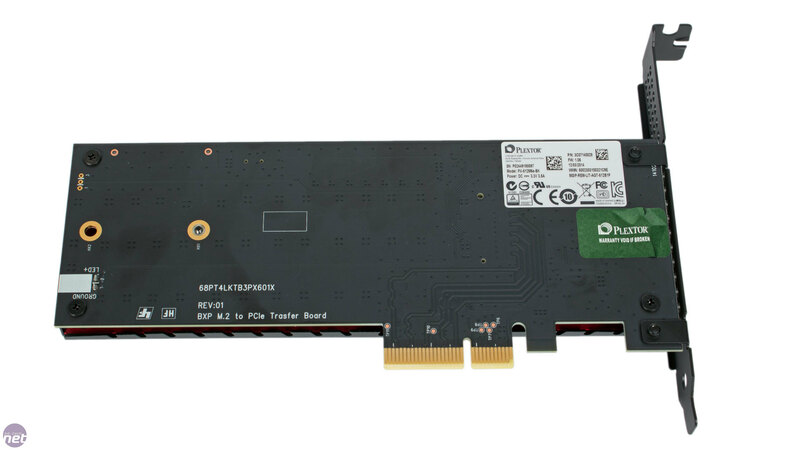 The SATA 6Gbps interface has long bottlenecked SSD performance, with differences between modern drives often amounting to very little and even less outside of benchmarks. 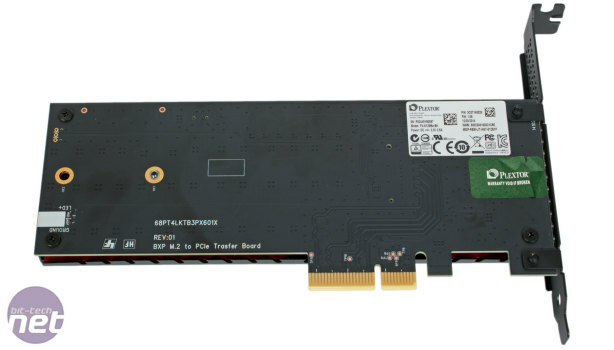 The move to storage that utilises PCI Express has been gradual but is finally taking shape, and we expect it will ramp up sharply later this year and early next. 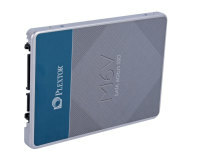 Plextor has been one of the first companies to offer PCI-E SSDs in the form of M.2 drives and PCI-E expansion cards. The M6e Black Edition falls into the latter category and was announced at this year's CES. It is effectively the previously released M6e SSD wrapped in a fancier package. The performance and specifications remain unchanged, with the capacity again topping out at 512GB, the one we're looking at here. The M6e was (and still is) available both as a standalone M.2 drive and as a PCI-E add-in card for those without an onboard M.2 socket. While they offer faster than SATA speeds, they both come with bright green PCBs; not typically an enthusiast's first choice. The M6e Black Edition, meanwhile, is only sold as an HHHL (half-height half-length) expansion card, but comes with an updated design that has two benefits. The main one is simply aesthetics. 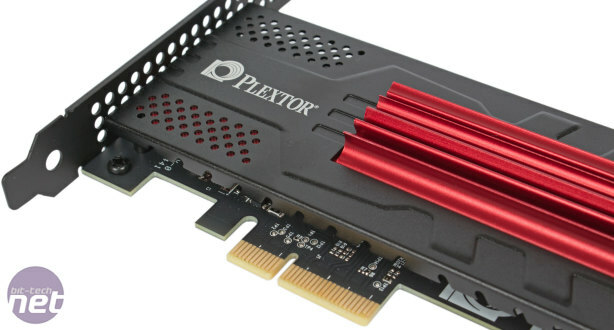 Plextor says that the M6e series targets extreme gamers and advanced users i.e. enthusiasts, and as we know these are very often people who care about the look of their hardware. The black PCB coupled with the aluminium of the red heatsink and black shroud is far more alluring than the standard M6e, and while this may be an overdone colour scheme it also will match a large number of motherboards and graphics cards. The second benefit is cooling. 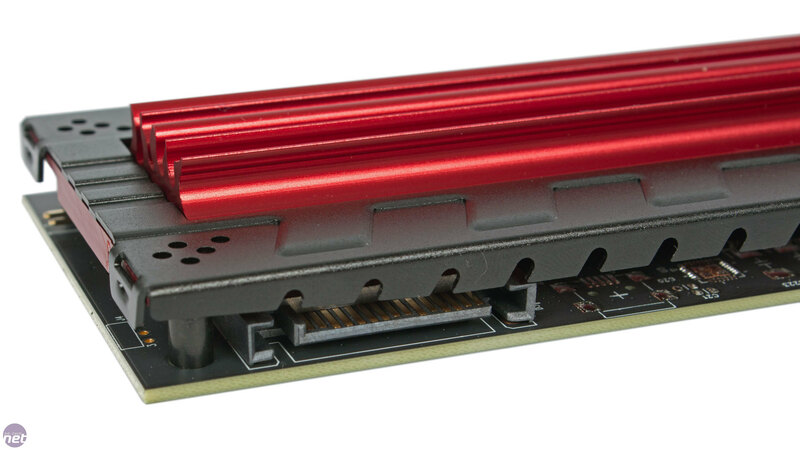 SSDs do not always need a lot of cooling, especially with most client/home user workloads where there is a lot of idle time between bursts of activity, but the sizeable heatsink will definitely keep things running cooler in the long run, and that's never a bad thing. The M6e Black Edition utilises a PCI-E x4 connector and will thus fit into all but the smallest PCI-E expansion slots. Depending on your exact slot configuration, you may have to install it in a full-size PCI-E x16 slot, potentially limiting future graphics upgrades (in micro-ATX motherboards, for example). The SSD itself only uses two PCI-E Gen 2.0 lanes, giving it a maximum bandwidth of 10Gbps compared to 6Gbps with SATA. It also sticks to the AHCI specification, rather than using the newer, SSD-optimised NVMe one, so while SATA's bandwidth bottleneck has been lifted, there will still be similar performance limitations in some instances. However, the use of older technologies ensures high compatibility with existing systems and has allowed Plextor to get a PCI-E storage device to market quickly rather than waiting for NVMe-certified controllers. 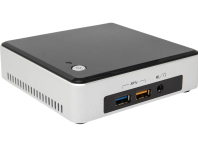 The drive is fully bootable, supported through native AHCI drivers in Windows 7 and above and also boasts support from Linux builds. 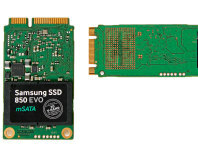 The specifications reveal a faster-than-SATA drive, most evidenced by the 770MB/sec and 625MB/sec sequential read and write speeds – SATA SSDs are capped at approximately 550MB/sec. The 256GB drive is almost as fast as this 512GB one, except for slightly slower sequential writes, but the 128GB is more hampered by its lower NAND die count. 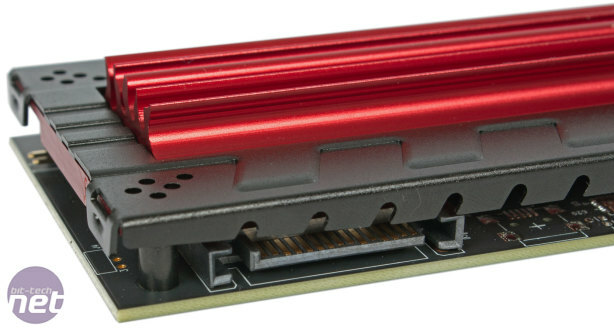 The hardware is not directly installed on the PCI-E card, but rather on a standard 2280 M.2 SSD, which is connected to the heatsink via a thermal pad for cooling. The PCB also has an auxiliary SATA power connector, presumably for older, low power PCI-E slots. There's also a series of yellow and blue surface mount LEDs that show drive activity and status, as well as a pin-out for your case's HDD activity LED header cable in case you want to use the M6e Black as a boot drive. 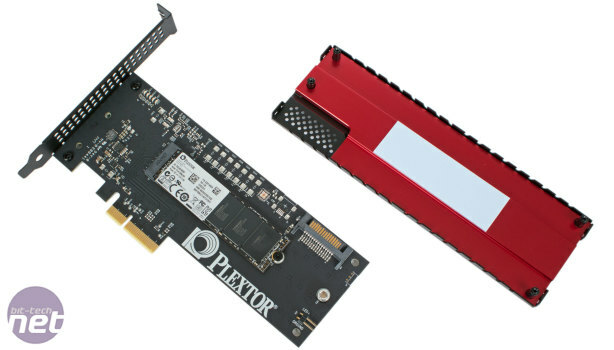 Plextor is using the Marvell 88SS9183 controller, a dual-core, PCI-E 2.0 x2 unit, with the company also handling its own firmware duties. 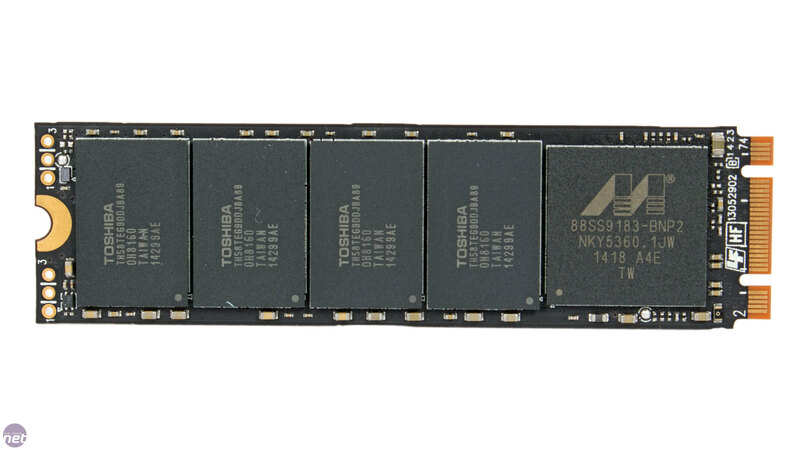 Toshiba 19nm NAND makes up the storage capacity, while a 1GB DDR3 cache is used for in-transit data and handling the mapping table. The M6e Black Edition supports the latest version of PlexTurbo – 2.0. 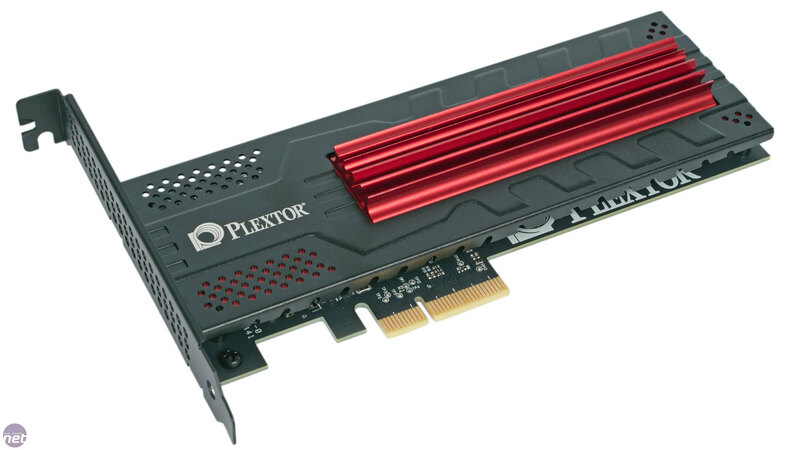 This is Plextor's answer to Samsung's RAPID Mode, using free system RAM to cache hot data for faster access and also to avoid unnecessary writes in the hope of life extension, although that's of little concern to most SSD users these days. The latest version increases the maximum usable memory to 4GB. The software also promises data loss protection for cached data in the event of power loss or sudden shutdown. Encryption is limited to AES 256-bit only; no TCG Opal or IEEE-1667 support here. This encryption capability coupled with Plextor's error checking algorithms is jointly referred to as TrueProtect. The drive comes with a healthy five year warranty, the same as the M6 Pro. There is no specified limit to how many writes this warranty covers, though; presumably since this is a client drive, enterprise workloads are not covered – it is likely at Plextor's discretion.